The review duo who have 99 problems, but cheating at baseball ain’t one. 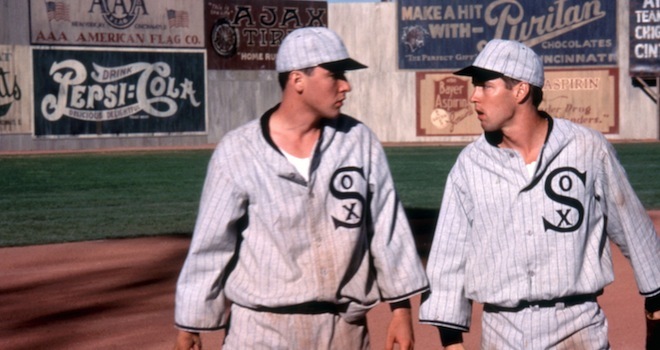 Adam: This week, our baseball movie series continues with the 1988 drama Eight Men Out, written and directed by John Sayles. The film tells the story of the infamous 1919 Chicago White Sox (dubbed “the Black Sox”) scandal where the Sox, then the clear best team in baseball, conspired with mobsters and gamblers to intentionally lose the World Series for money. Eight Men Out is an ensemble piece with a sprawling cast including John Cusack, Charlie Sheen, David Strathairn, D.B. Sweeney, Michael Rooker, Clifton James, Michael Lerner, Christopher Lloyd, John Mahoney, Bill Irwin, Kevin Tighe, and many more. We see the story through multiple lenses, ranging from the players, fans, sportswriters, gamblers, mobsters, and club owners and the approach is unwieldy at times and fascinating at others. I read a piece of IMDB trivia that states Sayles had a mandate to have the film come in under two hours, so he told the actors to talk fast. The same could be said for the baseball game scenes, which are manic to a point of distraction for me. That aside, the story is very interesting and I appreciate the approach of empathizing with the players while not condoning what they did. 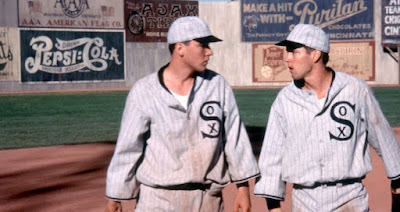 Eight Men Out is a film I actively avoided until this week because I’m a huge Chicago White Sox fan and I didn’t want to get in the muck of the darkest period of my beloved team. I’m happy I finally saw the movie. It was clear to me that Sayles is more interested in this as a story of corruption than right & wrong or the sanctity of baseball. It’s a wise approach, because owner Charles Comiskey (who welched on bonuses and underpaid his players) is at the crux of the reason all of this ended up happening in the first place. Overall, I liked the movie but didn’t love it. Near the end, John Cusack’s character (3rd baseman Buck Weaver, who didn’t take money and played well in the Series but also didn’t alert team officials when he knew his teammates were cheating) really comes into focus and I loved that part of the movie. He has a monologue to some kids in the third act that’s phenomenal. 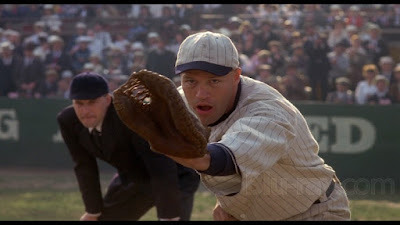 In order for him to take focus, though, the David Strathairn character (pitcher Eddie Cicotte, who Comiskey was most directly screwing over financially) has to fade into the background later when he was one of the most prominent characters in the first and second acts. I wonder if the movie would have clicked for me more if it were told through the eyes of just one or two guys, with the idea of getting the essence of what was happening, and not incorporating the full sprawl of every participant and their motivations. Rob: First off, let me say how proud I am of you for finally taking this one on, and how sorry I am on behalf of the city of Philadelphia (it was gamblers from Philadelphia and Boston who first broached the idea of throwing the Series) for what became the Black Sox Scandal. It’s probably the most infamous moment in our national pastime’s history, and it’s hard to deny that it contributed to the cynicism people carry about sports, even today. I’m sure we’ll talk a bit about the purity of the sport and all that, but — without speaking for Adam — I can say it was extremely difficult to watch Eight Men Out considering how deeply I love the game of baseball and how disturbed I am by the idea that any of its players would compromise their integrity (and that of the game) for money. 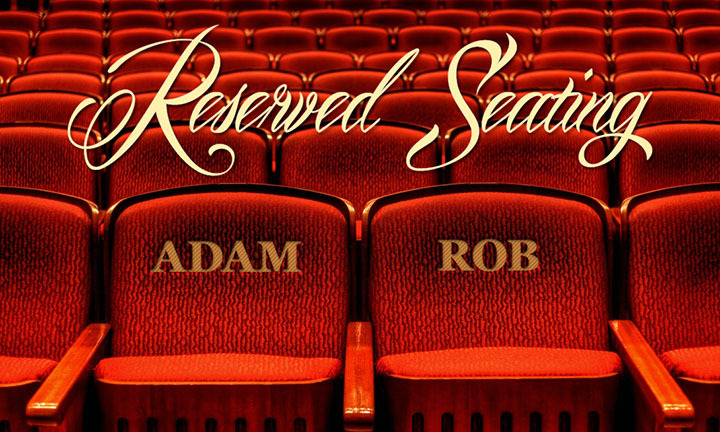 Adam: I think that’s one of the strengths of the movie. I texted you while I was watching Eight Men Out that I was maybe learning the wrong lessons from it and that was because I started from the sanctity of baseball place but was slowly being seduced in the rationale of why these guys threw the World Series. Of course it’s not the right thing to do and bastardized the game, but they certainly had a logical motivation not brought out of greed but more from hurt and retaliation. Rob: For sure. You definitely sympathize with the players. So, I mentioned on a podcast a few weeks back that I generally measure “based on a true story” movies by how much more enjoyment I get from the movie than I would from the Wikipedia article. 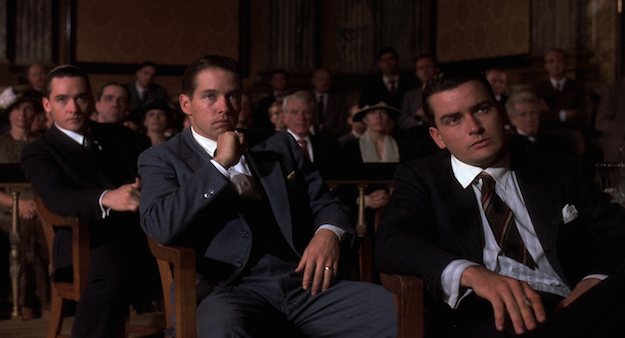 Eight Men Out is, well, about even in that regard. It’s well made and well acted, but I agree that it’s short of greatness. That being said, I also totally agree that Cusack’s relationship with the young fans is one of the standout bits. At one point — when the kids are asking him whether or not the rumors of corruption are true — he says, “When you grow up, things get complicated.” It’s such a simple and effective way of explaining an infuriating aspect of adulthood that seems totally incongruous with the singular beauty of childhood that baseball stands for. There’s a sense of frustrated injustice to Cusack’s delivery that sells it perfectly. Things should be easy. It’s really not fair at all. Life should be as simple as fielding a grounder to third. Ugh. Now I’m just getting emotional. 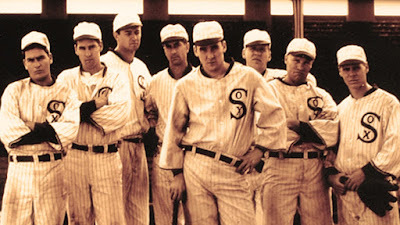 Anyway, I think John Sayles is a competent and attentive filmmaker, but Eight Men Out’s stodgy delivery misses a lot of opportunities for emotional resonance and — as you mentioned — there are a few structural and character issues that prevent it from coming into focus as coherently as it might have. Adam: I loved the moment where Cusack is reminiscing about the feeling you have when you hit a baseball just right. It sound sanctimonious, I’m sure, to people without of the love of baseball that we have, but I can honestly say that hitting a homer (I’ve hit one in my entire life) is magic. There’s no other word for it. Cusack describes the feeling of how the ball just gives when it hits your bat as you connect and it’s one of the greatest moments of pure joy I’ve had in my whole life. It was almost thirty years ago and I can still remember that moment vividly. Most baseball movies have a tin ear for things like that (where they boast about the magic of the game and it sounds false), but that dialogue from Cusack is perfect. Rob: Agreed. I was revisiting Bull Durham recently, and while I still like it, a lot of Ron Shelton’s script “tells” baseball love instead of “showing” it (to use reductive and overly simplistic terms) the way Eight Men Out does. Overall, what stood out most to me in Eight Men Out were those interpersonal conflicts between the players who were in on the fix and those who weren’t. That tension says so many things about the great undertaking inherent in every competition and the way that tacit understanding between teammates — that which says each one will do their best to support the team — is corrupted. It’s so hard to watch one player giving his all while another drops balls on purpose or delays an easy throw at the expense of an out. 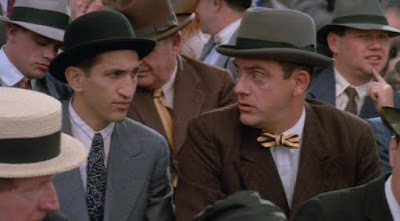 The actors in Eight Men Out really sell that, I think, especially in those early games when manager Kid Gleason (John Mahoney) and the sportswriters get wise to the scam and are trying to figure out who’s in and who’s out. Adam: I felt so bad for Gordon Clapp. He played the catcher, Ray Schalk, and was also Detective Medavoy on NYPD Blue. That’s my boy. Rob: Have you read Eliot Asinof’s book? I haven’t, but I’m definitely ordering it after this revisit. What’s the general attitude about the Black Sox among White Sox fans? What about Comiskey's general reputation? For comparative reference, one of the Phillies’ great shames is being known as the last team in the Major Leagues to integrate. I can’t say we think about it every day, but it’s something every Philadelphia fan has to come to terms with. Also, was every player in 1919 batting .400? It’s insane how much contact is made in this movie. Adam: It’s absolutely insane. There’s more hits than at a Chicago Dogs game (independent baseball team near me where no one can pitch and I mean NO ONE CAN PITCH). I haven’t read the book either. I don’t know among older Sox fans how they feel about the Black Sox, but my impression is that most fans begin keeping score (so to speak) with the 1959 “Go-Go White Sox” led by Luis Aparicio, Nellie Fox, Sherm Lollar, Billy Pierce, Al Smith, and Early Wynn. That team is still beloved here. They went to the World Series but lost to Sandy Koufax and the Los Angeles Dodgers. Comiskey’s reputation isn’t really discussed anymore either probably because his name hasn’t been on the ballpark since it turned into U.S. Cellular Field back in 2003. I laughed a little that the film showed the White Sox being cheap even back then because there’s definitely that sentiment among fans today. Rob: This is good for me, a baseball fan who recently adopted the Sox as his AL team, to know. Adam: Go Phillies! What did you think of the subplots with the mobsters, gamblers, and sportswriters? This was the area where I felt like the movie lost its footing the most. 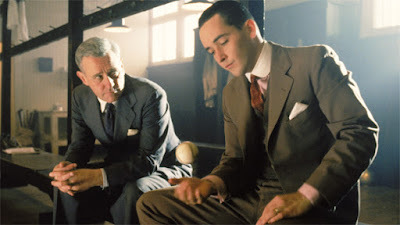 For example, Kevin Tighe as “Sport” Sullivan is a great and interesting character; so are Michael Lerner as Arnold Rothstein and John Mahoney as the manager. But then they disappear for huge stretches of the movie. It’s like Sayles was so breathless in trying to get everything in that he didn’t savor what he had. Who gave your favorite performance in the movie? Rob: Lerner has a few really solid moments (like the one where he talks about how being the “fat kid” who was picked last influenced his motivations to get in the racketeering/gambling game), but I agree that he’s another casualty of Eight Men Out simply having too much story to tell. You mentioned Mahoney, and I think he might be my pick for favorite performance. I still can’t get over how you can actually see the lights go out of his eyes when he realizes his boys are cheating, how they’re bastardizing this game he’s loved his whole life. It reminded me a lot of the moment in Say Anything when — rightfully accused of extortion by his daughter — he shouts, “I make their LIVES better!” In both performances, you can see how the internal conflict infects his delivery. He was so good. Adam: I miss John Mahoney. He was so great in everything. Mark Ahn for me for Eight Men Out. What are we reviewing next week? Rob: Mark Ahn for me, as well. This is one that I like so much more after our discussion. Our All Pacino series returns next week with 1993’s Pacino/De Palma reunion, Carlito’s Way. Nice review. I had never heard of this "Black Sox" scandal. But even though the White Sox were my team, I really only followed baseball in the 80's and early 90's, before the internet, and haven't paid any attention since then. 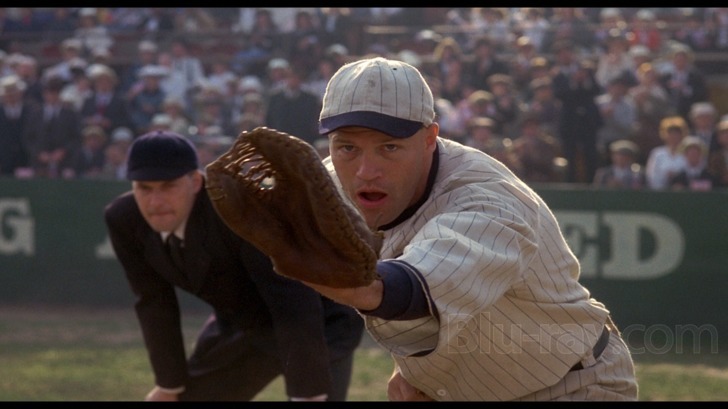 But I have a soft spot for baseball movies, and old timey ones in particular, so I'll add it to my watchlist. Good review guys. I loved this movie growing up and still find it fascinating today. Fun fact; the team actually earned the nickname "Black Sox" before the scandal. According to the Chicago Tribune, "Sox owner Charles Comiskey was known to be stingy with his players, even charging them 25 cents to clean their uniforms. In protest, many of them refused to pay, thus earning them the early nickname of the Black Sox."